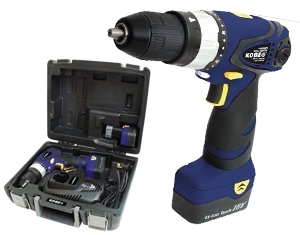 - Lightweight and well-balanced with a soft grip design, this drill has a built in LED light, 13mm keyless chuck, hammer-drill/drill-driver mode selection collar and 20 stage torque adjustment collar. - The variable speed with electric brake and reversible control switch gives it maximum versatility in driver mode. KBE-279-0090K • No load speed: 0 - 400/0 - 1400rpm. • Blows per minute: 21,000bpm.